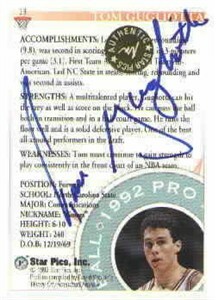 Extremely rare 1992 Star Pics certified autograph card of former North Carolina State Wolfpack superstar Tom Gugliotta, who later starred for the Minnesota Timberwolves and Phoenix Suns. This card features a full name autograph that Tom stopped signing shortly after the card was released. Authenticated with the Star Pics gold foil sticker. ONLY 2 AVAILABLE FOR SALE.